I woke up with a dull ache in the left side of my back. Didn't think much of it - just trials and tribulations of pregnancy. The pain started to get worse. I grabbed a heating pad. I couldn't get up to make breakfast for the boys, so my Mom did (we were cottaging at our family cottage). I sat with the heat for a while, willing the pain to subside and then the nausea hit. I made it to the bathroom and was sick.... quite a few times and then collapsed on the floor. I only remember bits and pieces after that. I remember my Mom saying she was going to call 911... the nearest hospital was 30 minutes away. I lay in agony (10 X worse than labour) and prayed that the paramedics get there soon. I knew something was wrong, very wrong, but in my heart of hearts I didn't think it had anything to do with the baby (directly anyway). When the paramedics arrived they pulled the gurney down our narrow cottage hallway and lifted me on. All I could think was "my boys are going to be so scared". My mom had put a movie on for them - all I can say is "thank goodness for the Chipmunks". They didn't make a sound, they even try to look. I think my poor little guys were terrified. My mom promised to keep them at the cottage - I didn't want them to come to the hospital, not like that. My husband was on his way from Toronto (about 2 hours away). I remember hearing the paramedic tell my mom that they were going to take me to Labor and Delivery. Oh, dear lord. I was so sick that I don't even remember being scared. Once I got to the hospital the pain had started to subside a bit. I waited for a doctor, waited for my husband. I've never more glad to see anyone in my life when hubby walked in the room. We had an ultrasound and what seemed like hours later (I think it actually was hours later) the OB came with the news. "You have and 8 centimeter cyst on your left ovary. It has twisted, assuming from the position of the baby, which has caused your ovary to lose its blood supply. This is what is causing the pain". Okay, great... so now what? "I will have to do emergency surgery this evening and remove both the cyst and the ovary, if not we could lose you and the baby. There is no other way." In the same breath the doctor said "and hopefully you don't miscarry". Wow, thank you, thank you very much for that. I remember just looking at her in disbelief and then at my husband. Did she really just say that? And so nonchalantly, at that? Well, losing this baby wasn't an option for me. We agreed to the surgery (not that we had much choice) and were waiting anxiously for the OR to open up. I was terrified and numb at the same time. I remember being wheeled into the operating room and one of the nurses talking to me. I don't remember exactly what she said, but it was something to do with the fact that she lost her son also. There were tears streaming down my face. I just shook my head, "I haven't lost him yet". Wow, was that foreshadowing, or what? When I came to, I #1 reached for my belly, still there and #2 screamed for my husband. The nurses went to get him and I felt better with him by my side. I was so, so sick from the anestetic and morphine and whatever else they had me doped up on but that was okay because our baby was okay. Thank God. A few days later I went home to recover, however, 10 days later ended back in hospital with continuous severe pain (same area). We opted for no MRI because it may harm the baby and each ultrasound showed the baby well and seemingly oblivious to all of my woes. The doctors concluded that I had a slow blood leak that was probably pooling and causing so much pain. So, at that point, it was just pain management, rest and to ensure that my blood level were going back up (which they were). Things did get better. I forced myself to rest. 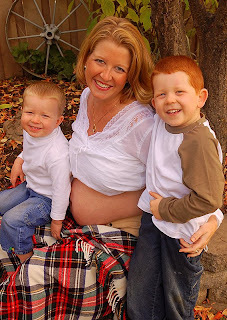 I had a lot of help with the boys, because when you have a 4 and 2 year old there is no such thing as rest, and I thanked God everyday that our baby boy was still with us and healthy. Fast forward 14 or so weeks to this post. It is entirely likely that something happened to our precious Nicholas way back on that rainy summer day in July. I lost so much blood... from the minute of my attack, through the surgery and the days following. I lost so much blood that I couldn't continue to provide it to my baby. My question is ....... WHY?!! Why didn't the doctors monitor that, why didn't they notice, why couldn't something have been done? Instead, I continued on believing everything was fine. That if only I was feeling this pain, if only I was suffering... that was OK! Obviously, that is not what happened. Something went horribly, horribly wrong and I will always have a hard time dealing with the "what if's". Okay - that's it for today - my head hurts. Oh the terrible "what if's" I wish I could take the pain way hon. I am so sorry that you had to go through this. How terrifying Lea. I'm so sorry for all you had to endure. Thank you for sharing this with us Lea. You did the absolute best you could for your Nicholas and he knows that. Sometimes I think the what if's are the hardest thing. Just awful, all this wondering and second guessing. You look so beautiful in that photo. I am so sorry precious Nicholas is not with you. I cannot stand the whats ifs either. Hugs and kisses.